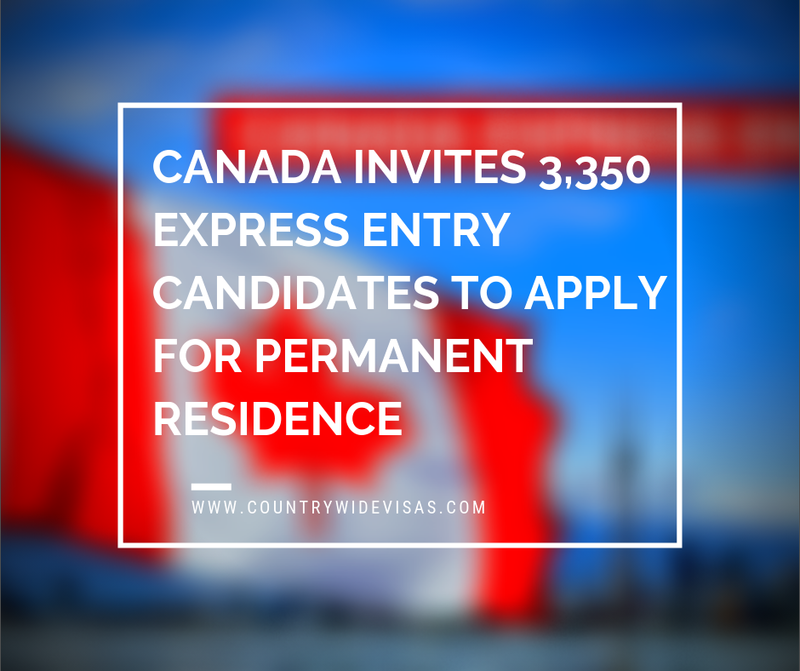 On March 20, 2019, the Express Entry Draw held in which Canada issued 3,350 invites to applicants to apply for Canada permanent residency. 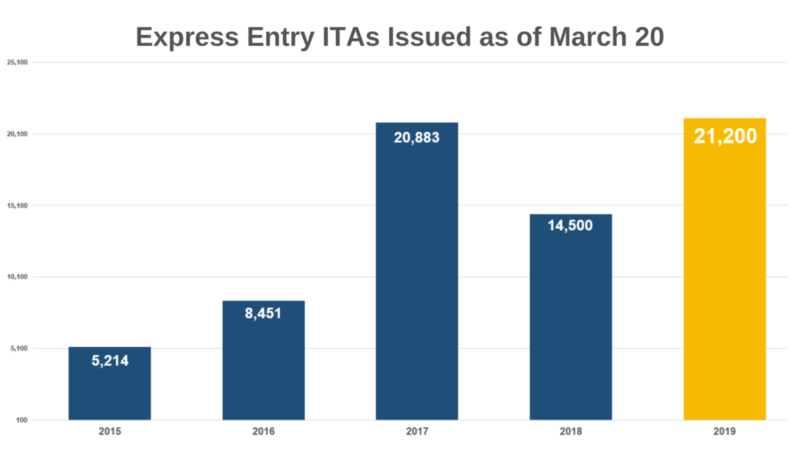 With this draw, now the total for invitations to apply through Express Entry program has become 21,000 in 2019, which are 6,700 more than ITAs issued at the same point in 2018. 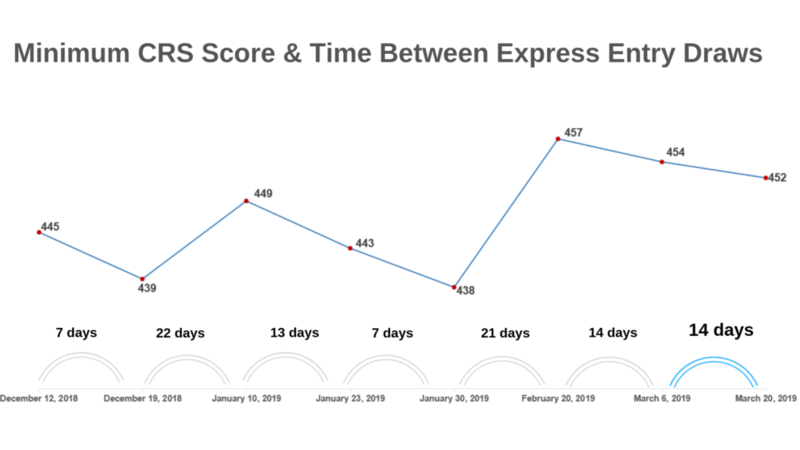 The lowest comprehensive ranking system (CRS) score was 452 in a draw held March 20; whereas, minimum score was 450 in the previous the Express Entry Draw held March 6. Moreover, this time the tie- the break was set on February 7, 2019, at 9:59:25 UTC. It means all those candidates who have scored at least 452 CRS score and applied to Express Entry pool before selected date and time, are eligible for ITA in this invitation round. The Government of Canada has also been planning to set a new ITA record for 2019 and 2020 through three immigration categories of Express Entry program including Federal Skilled Worker Class, Federal Skilled Trades Class, and Canadian Experience Class. So, this reduction of two points over the cut-off enhances the number of invitations through the latest Draw. In fact, the CRS cut-off has dropped down twice over the last two Express Entry Draws, and this was because of the fact Immigration Refugees and Canadian Citizenship (IRCC) held draws with elapse of two weeks only in both instances. Interested candidates need to submit applications under Express Entry for evaluation. The selection factors include age, education, work experience, adaptability, and language proficiency. Higher-scoring candidates in the Express Entry Pool receive Invitation to Apply (ITA) for permanent residency through regular draws. For further information, contact experts of countrywide visas. Countrywide visas is the fastest growing Immigration consultancy with a large, devoted team of Immigration experts offers hassle-free and professional services to its clients for filing their applications for various immigration programs.